Peter Mogila (also spelled Petro Mohyla or Petr Moghila; Ukrainian: Петро Могила, Romanian: Petru Movilă) was the Metropolitan of Kiev and Galicia from 1632 until his death in 1646. He established an education program in Kiev based on Western (Latin) academic concepts that stressed vindication of Orthodox primacy and doctrine and Church jurisdiction. Peter Mogila was born on December 21, 1596 in Moldavia into a Moldavian boyer family, the Movilesti. The Movilesti family had given Moldavia and Wallachia several rulers, including his father, Ieremia Movila. His mother, Margareta, was a Hungarian princess. Due to political turmoil in Moldavia, the family was forced to flee to Poland while Peter was young. Peter’s early education was in Poland at the Orthodox school in Lvov and continued in Western Europe, including at universities in Paris and Holland. He served as an officer in Poland, but he was more interested in a monastic life. He maintained his loyalty to the Orthodox Church while living in the Latin and Protestant West. In 1625 he entered the Pechersk Lavra in Kiev. After receiving minor orders, he was tonsured a monk in 1627. He later was ordained a priest and then raised to the dignity of archimandrite. Finally, he was consecrated a bishop shortly thereafter and then was enthroned as Metropolitan of Kiev in 1632. He was also the founder of Kiev-Mogila Academy in Kiev, which based academic instruction on the western system of seminary and university education, with instruction mainly in Latin and secondarily in Greek and Russian. Peter headed the Orthodox Church in what is now Ukraine during a period when it was under Polish rule. He was chiefly responsible for reviving Orthodoxy during the times after the 1596 Union of Brest-Litovsk, when a large amount of Orthodox in southwestern Russia submitted to Rome. With strong interests in the fortunes of the Orthodox Church, Peter devoted his energies to strengthening the position of those Orthodox who remained independent of Rome. Against strong, even violent, political and social pressures he was able to recover possession and restore many churches, including the Cathedral of St. Sophia in Kiev. 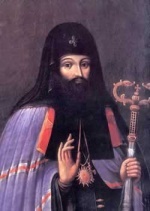 He died on December 22, 1646 in Kiev. He is venerated as a saint by the Churches of Ukraine, Romania, and Poland. His feast day is January 1, but he is also commemorated with other sainted metropolitans of Kiev on October 6. It is because of his numerous writings that Peter Mogila is most remembered and criticized. In 1637, he published an exegetical edition of the four Gospels. In 1646, his revised edition of his Evlogion, also known as the Great Trebnik, was published. He also wrote Short Scientific Essays about Points of the Faith and a Short Russian Catechism for the benefit of the Russian Church. It was his work Orthodox Confession of the Catholic and Apostolic Eastern Church, which he produced in reaction to the efforts of the Jesuits and western reformers in the Polish dominated areas of Old Rus, for which he is most remembered. The Confession, originally published in 1645, was published throughout Europe in Greek, Latin, German, as well as in Russian. His Confession was given standing over the following years, first by the local Council of Jassy in 1642, and subsequently by the patriarchs of the Churches of Constantinople, Jerusalem, Alexandria, and Antioch in 1643. In 1672, the Synod of the Church of Jerusalem adopted his Confession as the Orthodox Standard Catechism. His years as Metropolitan of Kiev were to constitute a pivotal turning point for the Orthodox Church in southwestern Russia as he provided education for the Orthodox clergy and laity in the schools based upon advanced Western European models. While the studies were mainly in Latin, and not in Slavonic or Greek, this education gave the students entree to the secular and religious writings of the West as well as of modern science. His college in Kiev reached a standard of excellence in the seventeenth century that was unequaled in the Orthodox world. This was another half a century before Peter I introduced western Europe in the heart of Russia. This page was last edited on October 24, 2012, at 15:35. This page has been accessed 27,958 times.